Horror films are usually a lot smarter than most people give them credit for. And the really good ones reflect the time they were made. If I’ve learned anything from the widely popular Purge franchise, is that this country is seriously messed up. The Purge series get an upgrade in the form of Oscar-winner Marisa Tomei which makes me wonder what bet she lost to end up here. That’s no knock at the “My Cousin Vinny” and “Spider-Man: Homecoming” actress– she’s fine here – but she’s not given much to do except glare at computer monitors. Otherwise the generally unknown cast is good; the acting is above average for this genre. The film, like its predecessors, isn’t so much horror as it is some kind of dystopian action thriller with the third act basically functioning as a siege film. The real horror comes from the realization that maybe our country is headed in the direction that these films present. 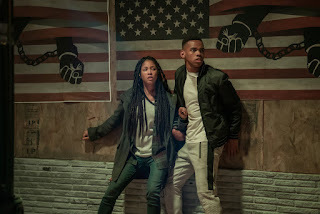 The Purge films are enjoyable for what they are. The problem is the premise is so goddamned smart but the films aren’t necessarily as smart as they think they are. I believe in writer/director James DeMonaco who serves on as screenwriter on this fourth entry. Stepping into the director’s chair is Gerald McMurray and some fresh blood is welcome. He doesn’t do much different from what DeMonaco has already established and the film’s script is as on-the-nose-political as it ever has been. Everyone by now knows that the annual Purge is basically a way for rich Americans to help get rid of the poor population. Rich people can afford to either barricade themselves indoors or can even afford to buy poor people to murder. “The First Purge” gives us a little glimpse into how this controversial, essentially racist American tradition came to be. Though it only really skims the surface and that’s where it’s a tad disappointing. A politician from a new political party not unlike say, the “Tea Party,” is elected president and someone gets the idea to let Americans let out their frustrations for one night during a 12 hour period in which all crime is legal. Staten Island is chosen for the experiment, which at this point, doesn’t actually have a name. Residents are free to leave during the experiment but those who choose to stay will be tracked and given $5,000 as compensation. Overseeing things are New Founding Fathers of America members Dr. May Updale (Tomei) and Chief of Staff Arlo Sabian (Patch Darragh). Meanwhile residents of the city include various minorities and low income individuals including a sister and brother and his drug lord. While like the other films, the premise is fascinating, the execution leaves something to be desired. It’s hard to care about most of these people since we don’t really know them. Lex Scott Davis is good as the sympathetic Nya and Y’lan Noel is good as Dmitiri the drug lord with the heart of gold. But most of these actors don’t have much to do except run around and look scared. Which leads to the other main problem, the film isn’t very scary. The premise is scarier than anything actually seen on screen. The film sort of won me over in its final act in which Dmitri must rescue those we’ve come to somewhat know in their apartment building.